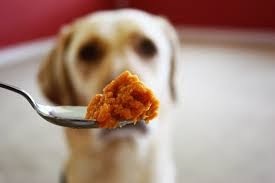 If your cat or dog has any type of digestive problems or has an occasional loose stool or constipation, a small amount of pure canned pumpkin (not raw or the sugary, spicy pie filling) mixed into the food can really help. Pumpkin is high in fiber and helps regulate the natural wave action of the intestinal tract. It is also a good source of natural Vitamin A and antioxidants. Too much pumpkin can have a laxative effect, but a couple of teaspoons a day for little pups, or a couple of tablespoons for big boys, should keep them right on track. Digestive Health: It can help dogs and cats with indigestion or upset stomachs and can aid dogs and cats with both constipation and diarrhea as it helps to promote the natural wave action of the intestines. Weight Loss: Due to the high fiber content, their tummy will feel full longer, and they might even thank you for the additional flavor.